What do dietitians eat when they order takeaway? 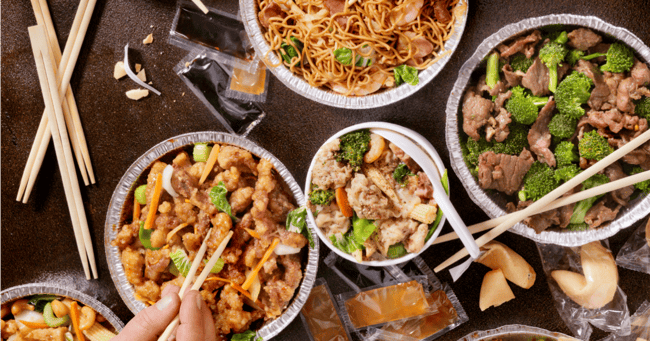 Five dietitians tell us what they eat when they order take-away. Many nights have been spent snuggled on the lounge with a container of takeaway and whatever’s trending on Netflix. Ordering in can save you a whole lot of time and effort, but the cold hard truth is that these meals aren’t always going to be a nutritious choice. In some cases it’s impossible to determine exactly what’s gone into them. That’s not to say you can’t eat an entire pizza or Pad Thai by yourself if that’s what your heart (and/or stomach) desires, but takeaway doesn’t always have to be so indulgent. Dietitians know their stuff when it comes to food — it&apos;s their job, after all — so we asked five of them to tell us what they order from the takeaway menu. They&apos;re only human, after all. Melanie McGrice favours her local fish and chip shop, Saltwater Grill in Melbourne&apos;s Albert Park — and there&apos;s one dish she&apos;s particularly fond of. "My favourite takeaway is grilled dory and salad. I prefer dory to flake, as it has more omega 3 and less mercury," she explains. It&apos;s pretty tasty, too. Accredited dietitian and expert the new FIT Nutrition Fix store. When Olivia Bates opts for takeaway, she has three go-tos: Japanese sushi, Thai stir-fries, and Chargrill Chicken&apos;s salads. "I tend to opt for sashimi or rice paper rolls because you can see exactly what is in them and there are no hidden nasties," Bates explains. Sometimes she&apos;ll opt for a sashimi salmon and avocado hand roll with purple or brown rice, because a) it&apos;s delicious, b) doesn&apos;t require sauce, and c) delivers a good dose of omega 3 and good fats. "I am conscious of the sugar used to sweeten the rice, though, so I limit my [hand] roll intake and instead try and fill up on sashimi and rice paper rolls instead," Bates adds. When it comes to Thai food, she hits up the stir-fry menu, choosing either a vegetarian or chicken option because they&apos;re "packed" with veggies and served with steamed rice. Bates also loves Chargrill Chicken&apos;s salads range, and not just because they remind her of her school days. "I have some big faves: ricotta and spinach wontons, shredded chicken salad, or there is usually some kind of barley and vegetable one. I am just careful of the dressings and always get them on the side." Caitlin Rabel prefers to "indulge a little" when she dines out, so she doesn&apos;t eat a lot of takeaway. But when she does, there are a few ways she keeps things healthy. "There are no &apos;bad&apos; takeaway foods as such, and as part of a balanced diet any food can be healthy," she says. Right on. If Italian is on the menu, Rabel orders entree-sized portions of pasta because the regular serves are often huge. If it&apos;s fish and chips, Rabel opts for grilled fish and adds some microwaved frozen veggies on the side so she&apos;s not just filling up on chips. When it comes to Asian cuisine, Rabel has a few recommendations. "Stir-fries can be very healthy options if they are packed full of vegetables and some lean meat. Try a chilli or lemon and garlic sauce, sweet chilli, satay and oyster sauces tend to be quite high in sugar," she explains. "I love dumplings, but having them boiled or steamed makes them much healthier. I usually try and get some Asian greens on the side as well." Rabel&apos;s go-to quick and easy takeaway lunch is sushi or rice paper rolls, although she avoids crispy or tempura varieties as they tend to contain a lot of extra oil. As for dessert, no, it isn&apos;t completely out of bounds. "I don&apos;t always have dessert, but if I feel like some I will. I try to share with my partner so it is cheaper and we are usually satisfied by half," Rabel says. If you love Lebanese food, you&apos;re about to be very happy. "I personally love going out for Arabic cuisine meals, particularly lean beef or lamb skewers with sides of tabouli, hommus, babaghanoush and pickles," Baqleh explains. "It is a refreshing, light and well balanced meal that is high in quality proteins, fibre and colourful vegies. It is mostly free from refined carbohydrates and saturated fats. Olive oil is used for extra flavour and heart health benefits." Baqleh&apos;s on-the-run pick is brown rice sushi with salmon and avocado. "It is filling, delicious and full of heart healthy fats. Contains less saturated fat and is less processed than many other quick takeaway options," she says. Yes, Subway is fast food — but if you play your cards right it can be a healthier option. "I always choose a grainy roll or wrap, with a base of either avocado or hummus. Then I pack it with delicious rainbow coloured salad and lean protein, add a bit of pepper for taste – and the occasional sweet chilli sauce," Brunner says. "The salad and roll are high in fibre to fill you up, and lean protein is essential to satisfy hunger and stop afternoon (or late-night) munchies. Grainy rolls are also of a medium to low glycaemic index, so will sustain your energy. I love incorporating avocado, hummus or fish as they contain important omega fatty acids." Processed meats and creamy sauces are generally best avoided, Brunner says, as they can be high in saturated fat and energy. What do you eat when you order in?